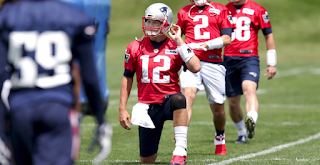 Recent reports by ESPN’s Mike Reiss indicate that the New England Patriots will take part in OTAs without their quarterback once again. Tom Brady missed last year’s program for the first time in his career and is set to do the same this time around. The quarterback isn’t required to be there, as they are voluntary workouts. It also is not uncommon for players to rest or train elsewhere during the timeframe of OTAs. Despite skipping OTAs last year, the veteran QB led his team to another championship while tallying 4,355 yards, 29 touchdowns and a 97.7 quarterback rating throughout the regular season.